This user-friendly guide is for anyone grappling with hard-to-pin-down causes of chronic pain, fatigue, gas, bloating, and other common disorders associated with the gut, as well as those wanting to improve their overall health. Addressing a wide range of conditions—including digestive problems, anxiety, and depression—this easy-to-use guide presents simple and direct ways to relieve the stress related to some of today's most pressing health problems. It shows the devastating impact that imbalances of gut microbiota and the microbiome can have on digestion—and on hormonal, immune, and brain function—and demonstrates proven techniques to reconnect with our bodies and reclaim our health. Allison Post, an integrative medicine health coach and somatic educator, and Stephen Cavaliere, a fitness coach, offer a holistic, step-by-step plan to overcome stress, settle into authentic breath- and body-centered experience, and navigate through the exciting new world of the microbiome. The Gut Wellness Guide introduces the method of Unwinding, a clear and accessible way to connect the “gut brain” to the “main brain” and to relax, tune in to your body, and create a customized action plan to heal. Previously published as Unwinding the Belly, this book has been thoroughly updated and revised. Teaches self-help techniques for increasing metabolism and cellular energy and revitalizing the natural healing powers of the body. Addressing a wide range of conditions--including digestive problems, anxiety, and depression--this easy-to-use guide presents simple and direct ways to relieve the stress related to some of today's most pressing health problems. It shows the devastating impact that imbalances of gut microbiota and the microbiome can have on digestion--and on hormonal, immune, and brain function--and demonstrates proven techniques to reconnect with our bodies and reclaim our health. Allison Post, an integrative medicine health coach and somatic educator, and Stephen Cavaliere, a fitness coach, offer a holistic, step-by-step plan to overcome stress, settle into authentic breath- and body-centered experience, and navigate through the exciting new world of the microbiome. 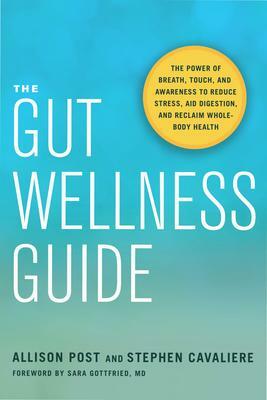 The Gut Wellness Guide introduces the method of Unwinding, a clear and accessible way to connect the "gut brain" to the "main brain" and to relax, tune in to your body, and create a customized action plan to heal. Previously published as Unwinding the Belly, this book has been thoroughly updated and revised.